It's been over two months since Android 4.0 (Ice Cream Sandwich) launched and the adoption rate is nothing short of pitiful. It's sort of a disaster. The numbers, posted on Android's developer site, paint a pretty sad picture of adoption rates. 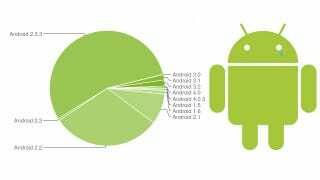 The data was gathered during a 14-day survey of Android devices that had accessed the Android Market. 55.5-percent of the devices were running Gingerbread (2.3). The tablet OS, Honeycomb (3.0), only accounted for 3.3-percent of devices to access the site during the time period and Ice Cream Sandwich (4.0) posted 0.6-percent. Froyo, (2.2) which has been out for 20 months, is still chugging along at 30.4-percent.